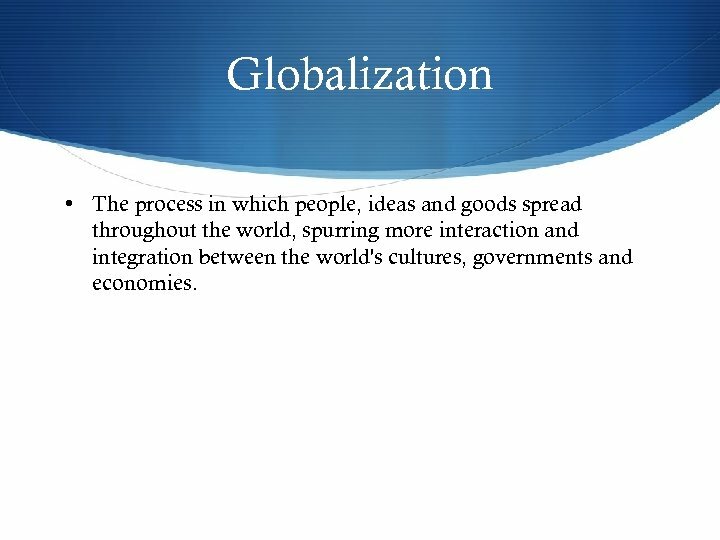 Globalization • The process in which people, ideas and goods spread throughout the world, spurring more interaction and integration between the world's cultures, governments and economies. 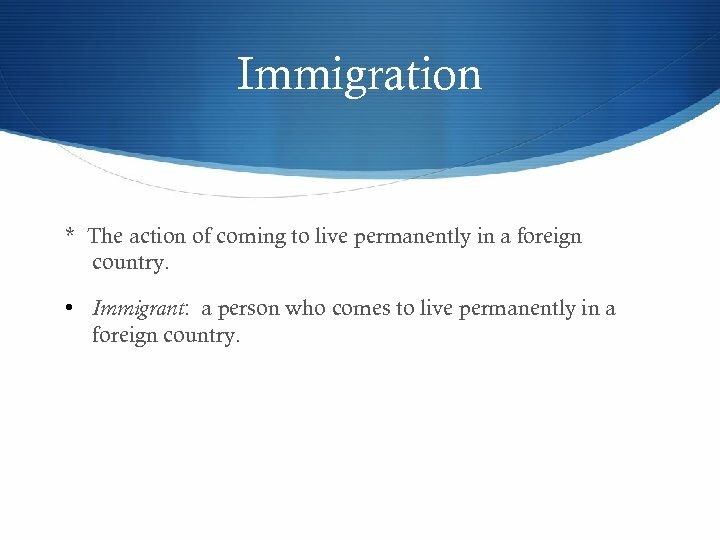 Immigration * The action of coming to live permanently in a foreign country. 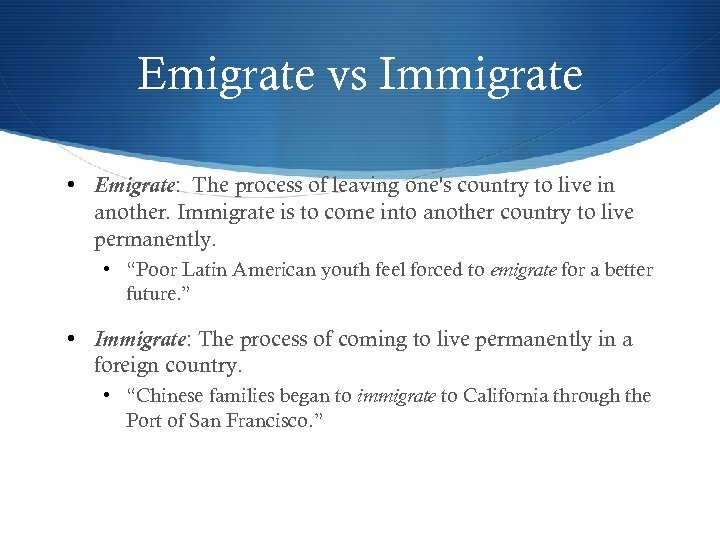 • Immigrant: a person who comes to live permanently in a foreign country. Refugee * A person who flees for refuge or safety, especially to a foreign country, as in time of political upheaval, war, etc. 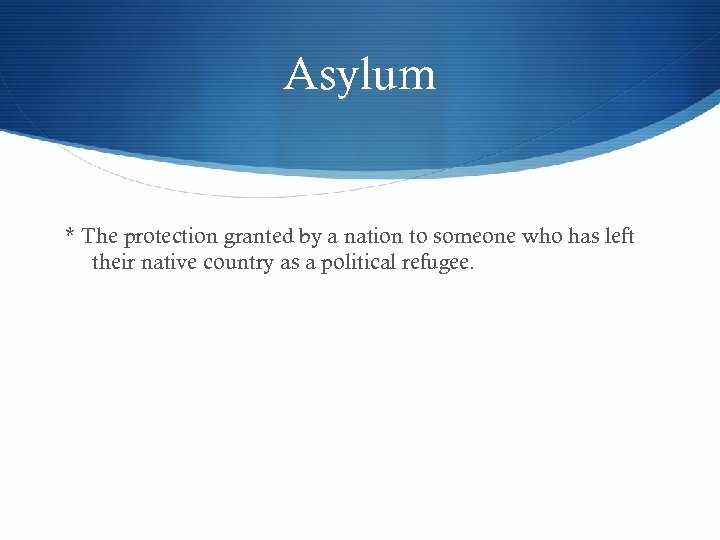 Asylum * The protection granted by a nation to someone who has left their native country as a political refugee. 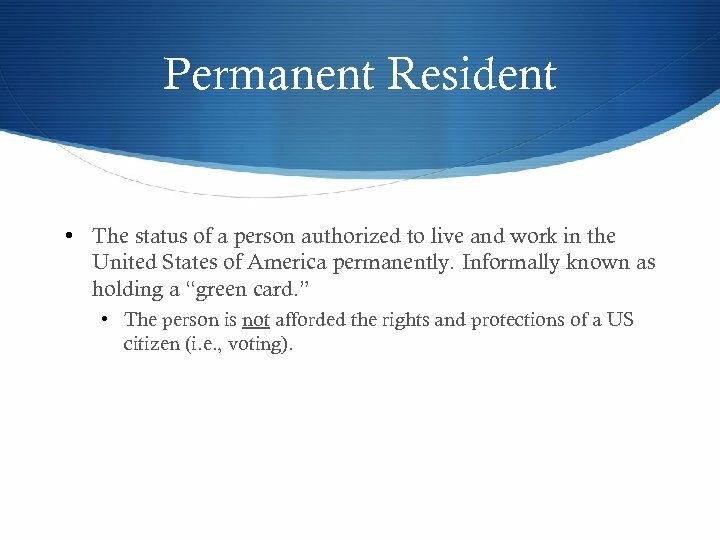 Permanent Resident • The status of a person authorized to live and work in the United States of America permanently. Informally known as holding a “green card. ” • The person is not afforded the rights and protections of a US citizen (i. e. , voting). Visa * An endorsement on a passport indicating that the holder is allowed to enter, leave, or stay for a specified period of time in a country. Naturalization • The process by which a foreign citizen becomes a citizen of a new country. 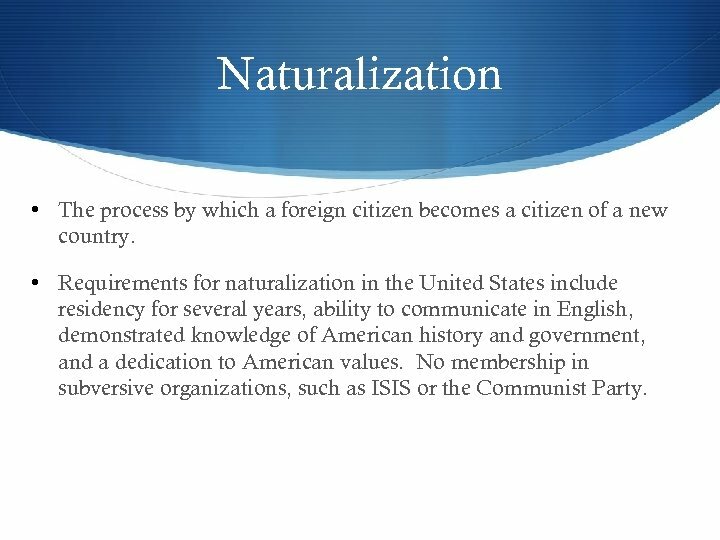 • Requirements for naturalization in the United States include residency for several years, ability to communicate in English, demonstrated knowledge of American history and government, and a dedication to American values. No membership in subversive organizations, such as ISIS or the Communist Party. 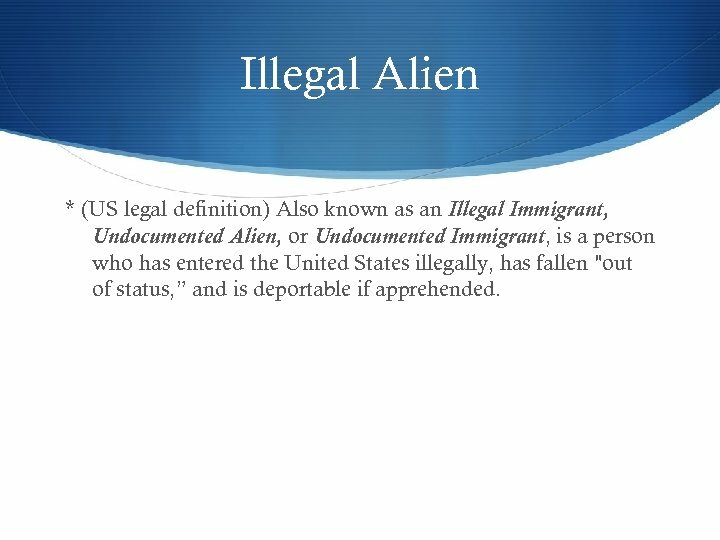 Illegal Alien * (US legal definition) Also known as an Illegal Immigrant, Undocumented Alien, or Undocumented Immigrant, is a person who has entered the United States illegally, has fallen "out of status, ” and is deportable if apprehended. 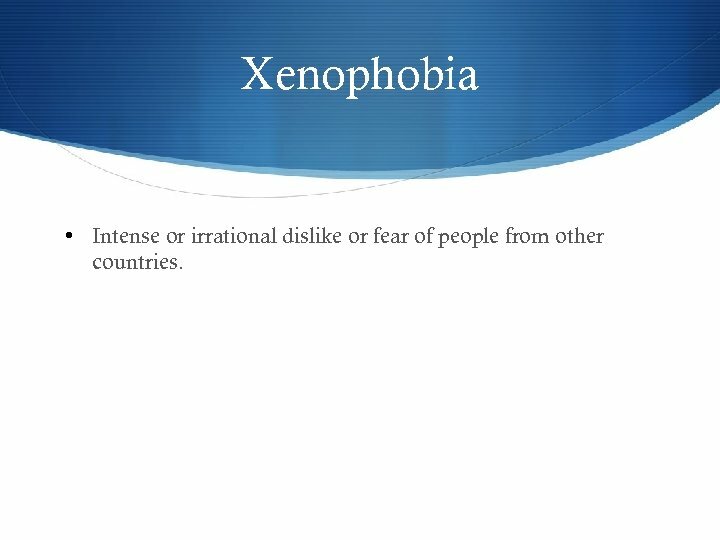 Xenophobia • Intense or irrational dislike or fear of people from other countries. 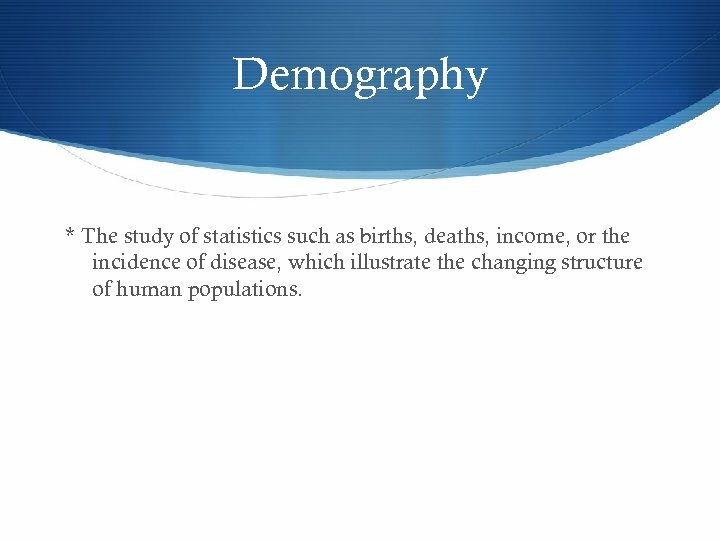 Demography * The study of statistics such as births, deaths, income, or the incidence of disease, which illustrate the changing structure of human populations. 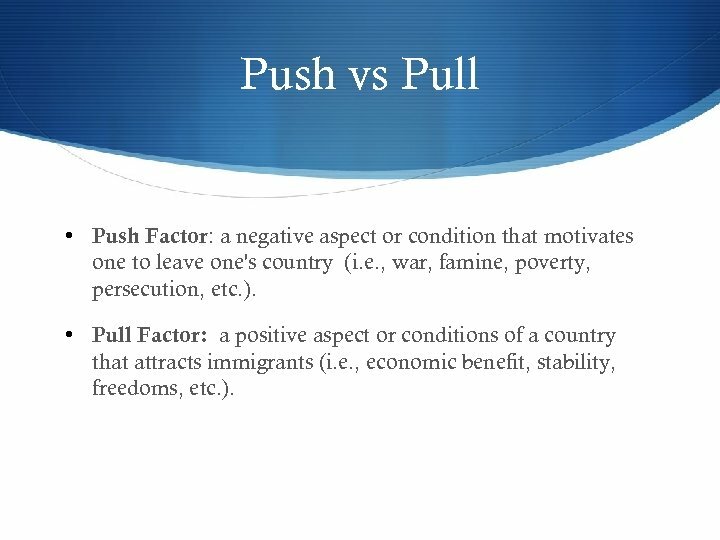 Push vs Pull • Push Factor: a negative aspect or condition that motivates one to leave one's country (i. e. , war, famine, poverty, persecution, etc. ). • Pull Factor: a positive aspect or conditions of a country that attracts immigrants (i. e. , economic benefit, stability, freedoms, etc. ). Assimilation What do you know of assimilation? In what context have you heard this word used? What does it mean? Assimilation • To become similar to one’s environment. 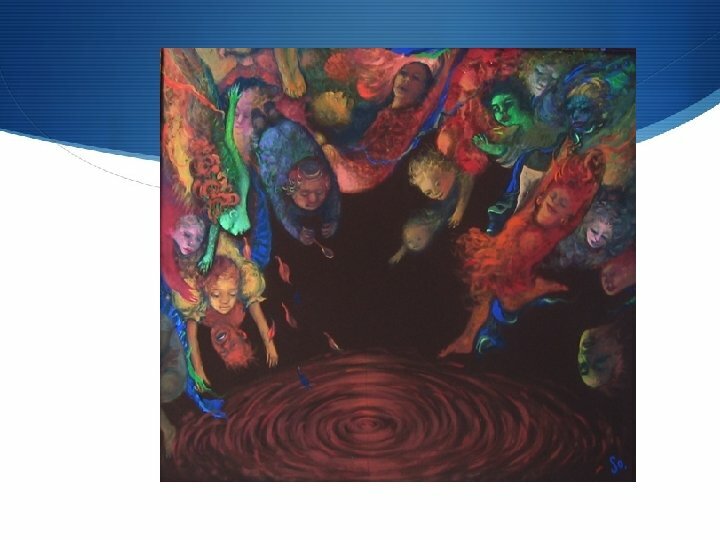 • The social process of absorbing one cultural group into harmony with another. 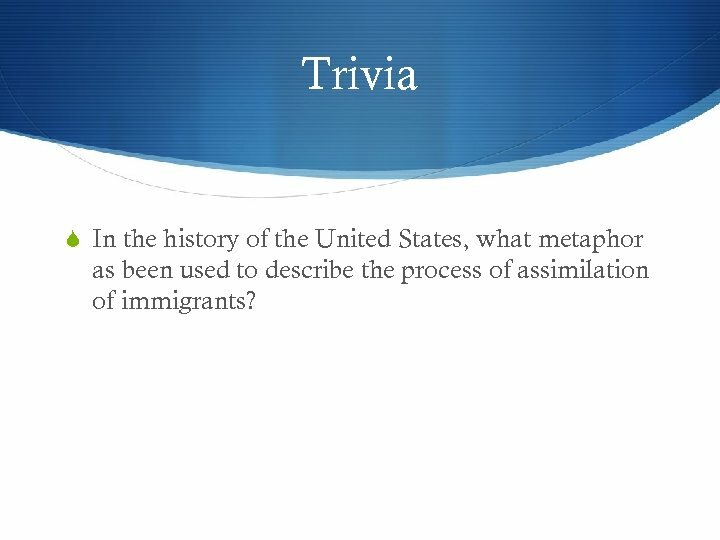 Trivia In the history of the United States, what metaphor as been used to describe the process of assimilation of immigrants? 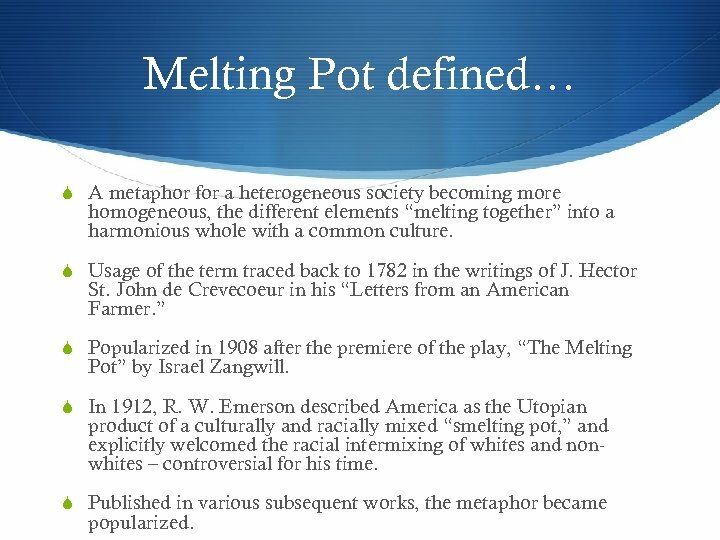 Melting Pot defined… A metaphor for a heterogeneous society becoming more homogeneous, the different elements “melting together” into a harmonious whole with a common culture. Usage of the term traced back to 1782 in the writings of J. Hector St. John de Crevecoeur in his “Letters from an American Farmer. 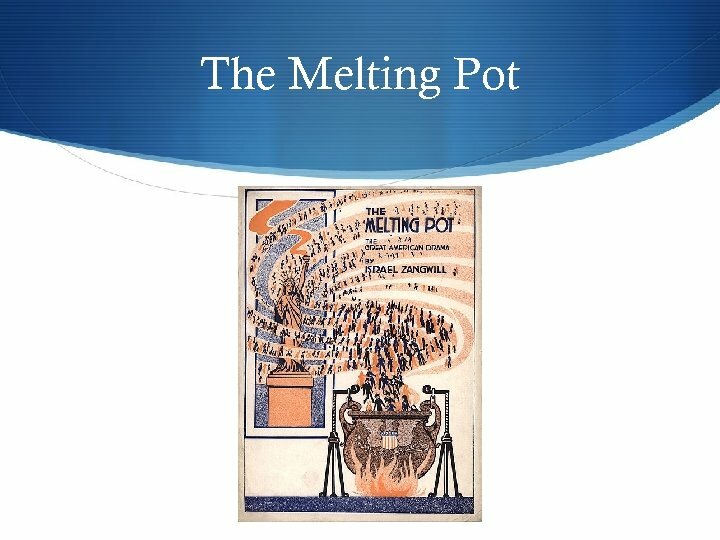 ” Popularized in 1908 after the premiere of the play, “The Melting Pot” by Israel Zangwill. 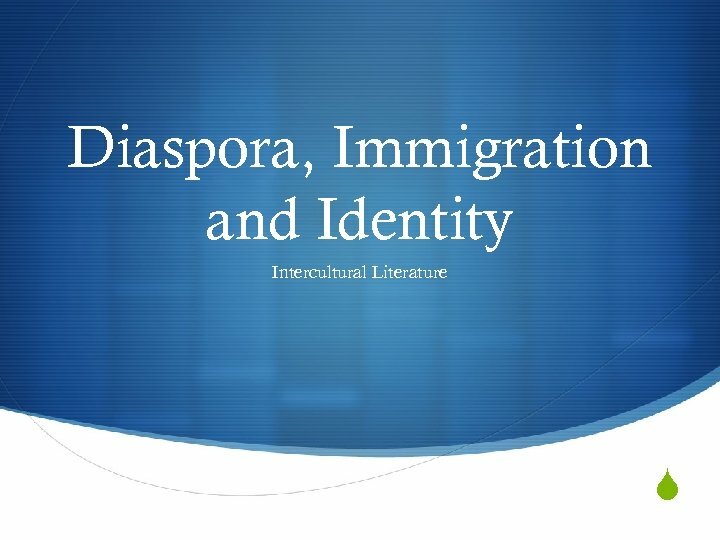 In 1912, R. W. Emerson described America as the Utopian product of a culturally and racially mixed “smelting pot, ” and explicitly welcomed the racial intermixing of whites and nonwhites – controversial for his time. Published in various subsequent works, the metaphor became popularized. 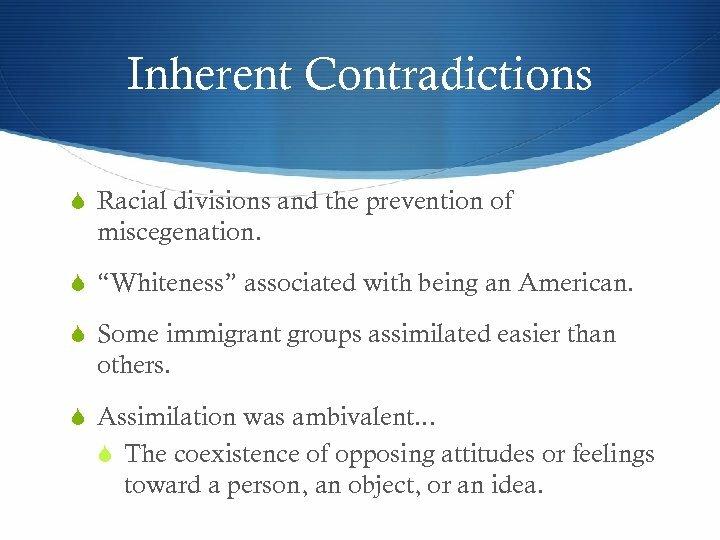 Inherent Contradictions Racial divisions and the prevention of miscegenation. 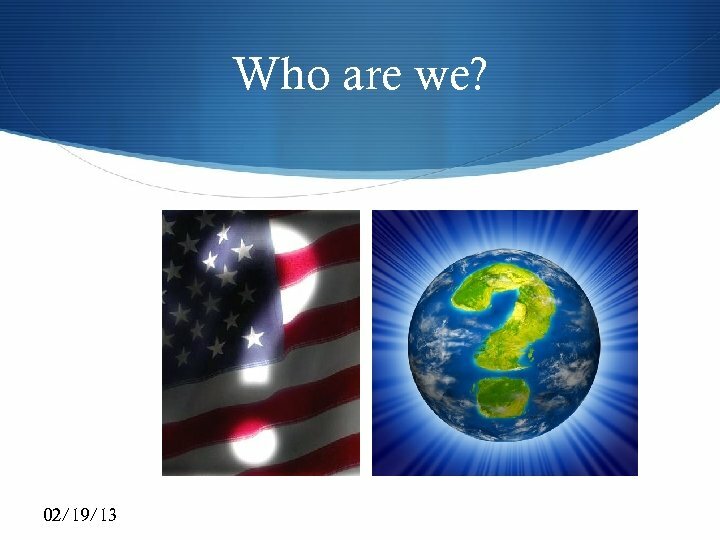 “Whiteness” associated with being an American. 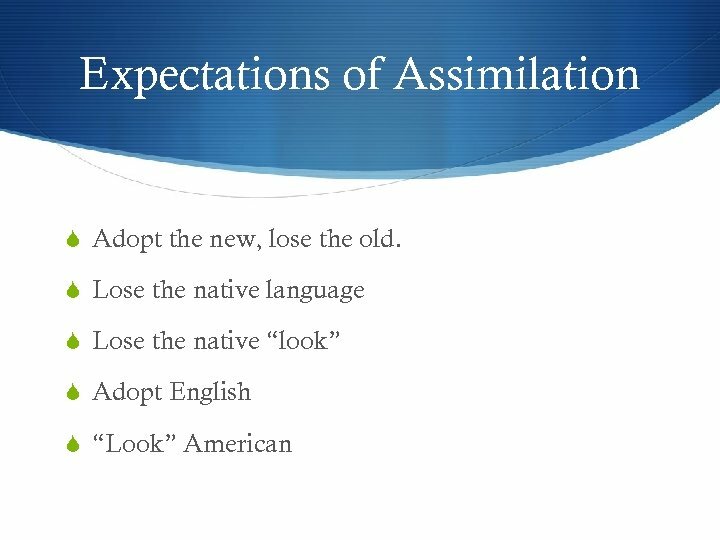 Some immigrant groups assimilated easier than others. 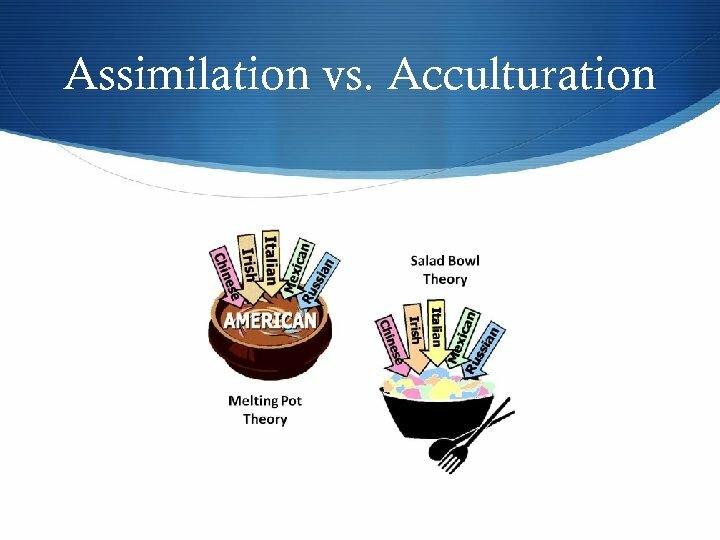 Assimilation was ambivalent. . . The coexistence of opposing attitudes or feelings toward a person, an object, or an idea. 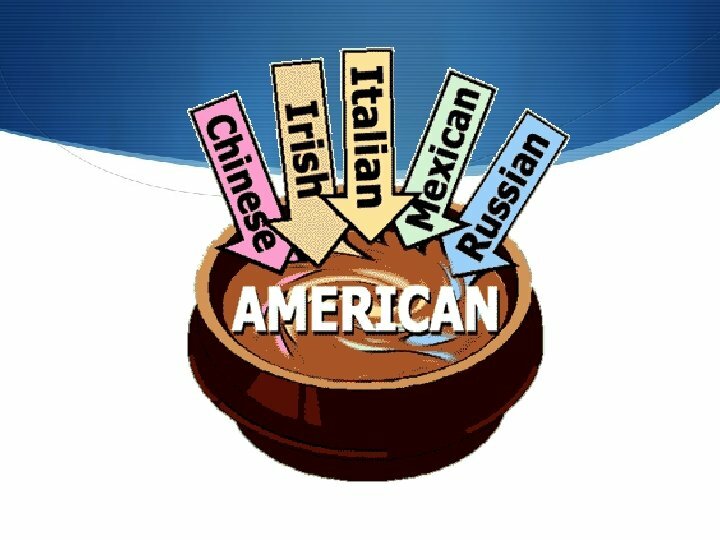 Is the United States a melting pot? Should the United States be a melting pot? Trivia In the United States, what Latin phrase is historically used to describe the idea of assimilation? Trivia What alternate metaphor was proposed by multiculturalists in response to the Melting Pot? Acculturation The exchange of cultural features that results when groups of individuals having different cultures come into continuous first hand contact; the original cultural patterns may be altered, but the groups remain distinct (Kottak, 2007). 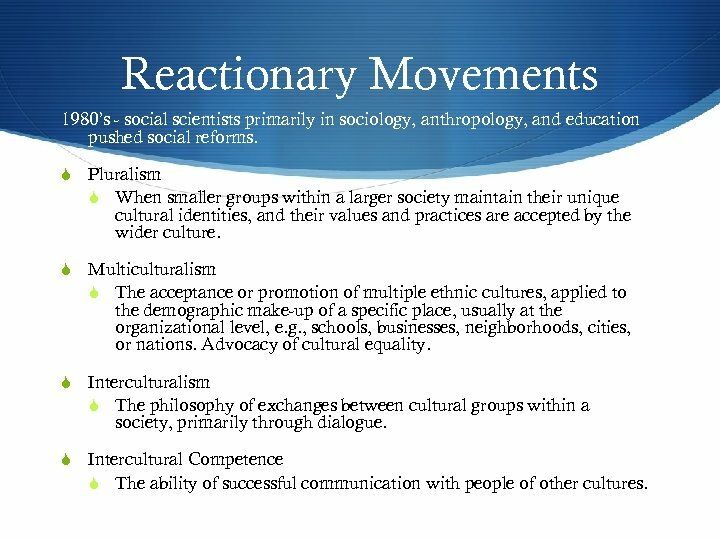 Reactionary Movements 1980’s - social scientists primarily in sociology, anthropology, and education pushed social reforms. 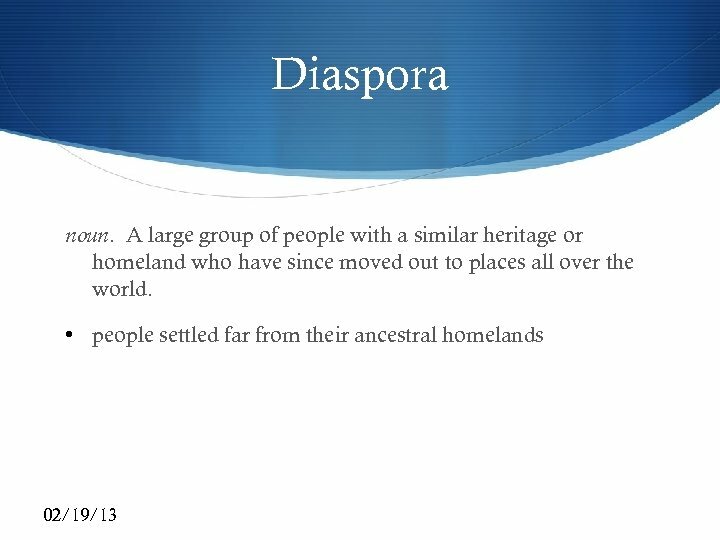 Pluralism When smaller groups within a larger society maintain their unique cultural identities, and their values and practices are accepted by the wider culture. 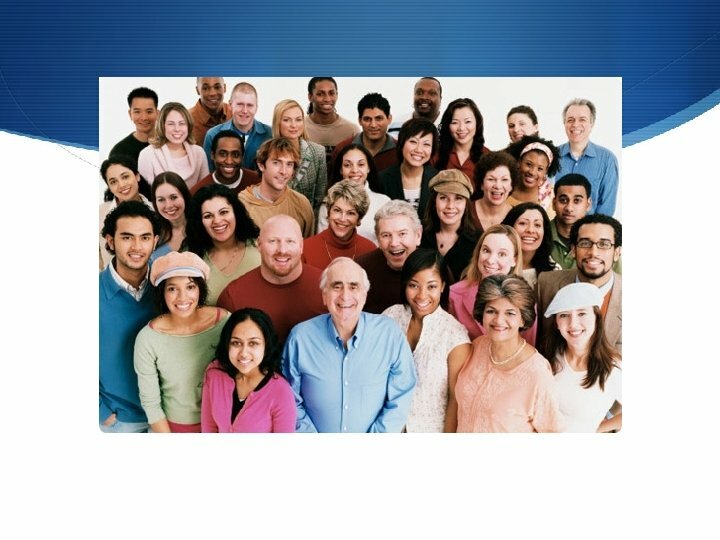 Multiculturalism The acceptance or promotion of multiple ethnic cultures, applied to the demographic make-up of a specific place, usually at the organizational level, e. g. , schools, businesses, neighborhoods, cities, or nations. Advocacy of cultural equality. 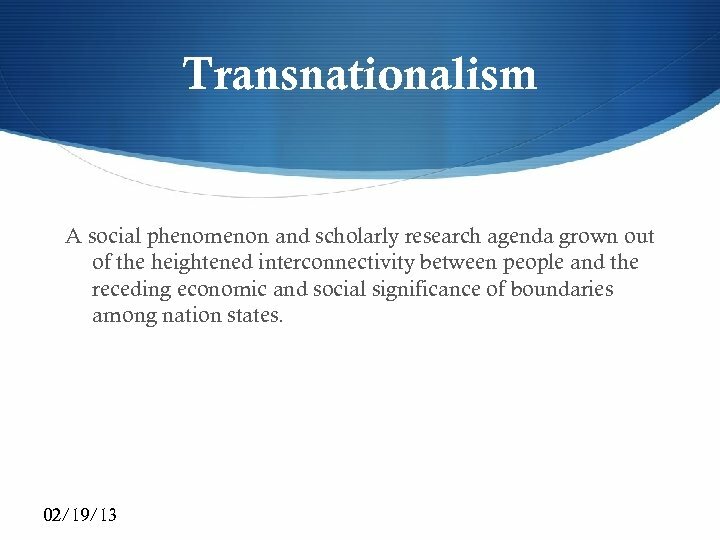 Interculturalism The philosophy of exchanges between cultural groups within a society, primarily through dialogue. 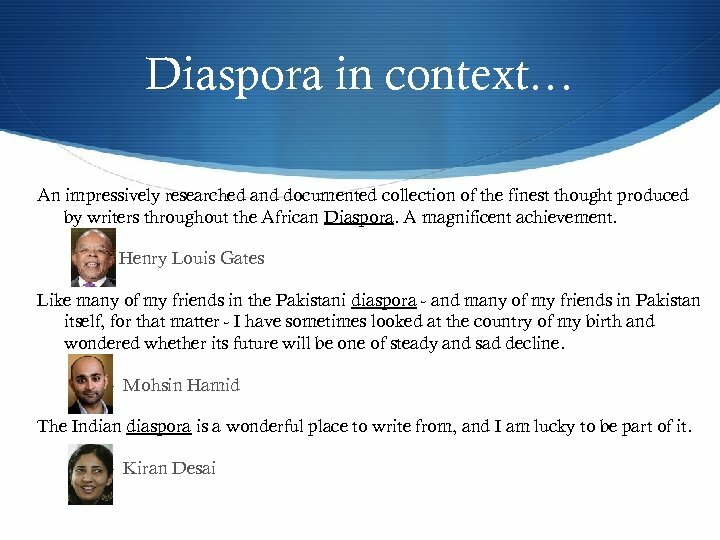 Intercultural Competence The ability of successful communication with people of other cultures. 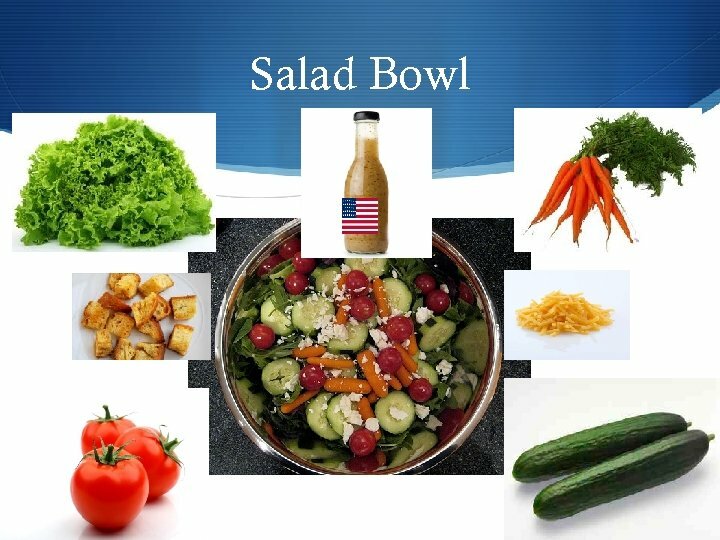 Melting Pot or Salad Bowl? 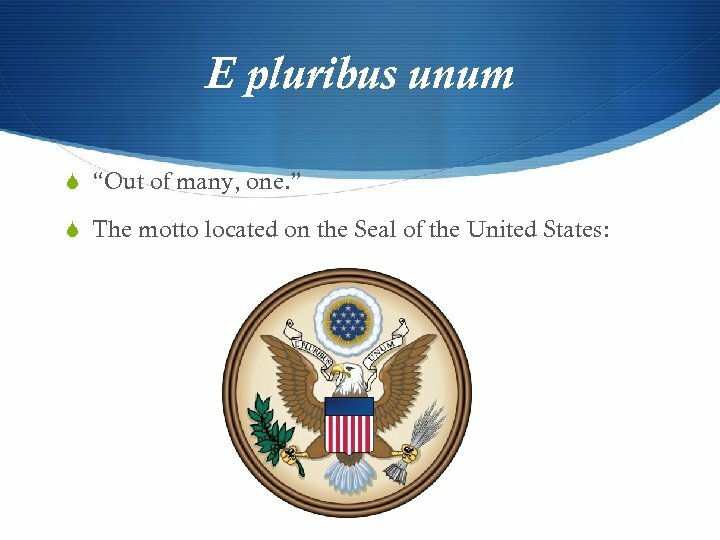 In your opinion, which metaphor is most appropriate to describe the United States today? Do you have an alternate metaphor to offer?